That's how 3 players get seats for the $1 Million GTD for ONLY $0.50! Congratulations to members: nina parker, w1n57on and knit, who each won a $540 seat to our next Million Dollar Sunday on September 13th with ‘Million or Bust’ Jackpot Poker. The buy-in was just 50 cents, and you could be next in punching a free ticket to our $1,000,000 GTD event. See more! Similar Threads for: That's how 3 players get seats for the $1 Million GTD for ONLY $0.50! That's awesome. I wonder if any of those are cardschat members. I played in one of these and it's a cool promotion. Maybe next time I'll hit the longshot. That would be nice. Nice would like to get that kind of luck! re: Poker & That's how 3 players get seats for the $1 Million GTD for ONLY $0.50! 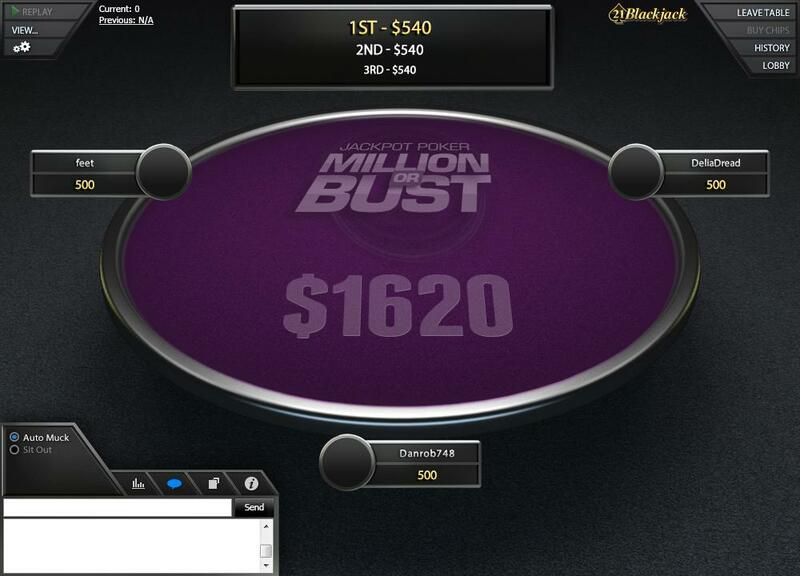 DeliaDread, feet & Danrob748 just killed it by winning their $540 Million Dollar Sunday entry with Million or Bust. ct1435605, MoveMaker & LIFEOFAGONY4U just killed it by winning their $540 #MillionSunday entry with https://www.americascardroom.eu/online-poker-promotions/million-or-bust/. Congratulations to members: ct1435605, MoveMaker & LIFEOFAGONY4U, who each won a $540 seat to our next https://www.americascardroom.eu/poker-tournaments/online-tournaments/million-dollar-sundays/ on September 13th with ‘Million or Bust’ Jackpot Poker. The buy-in was just 50 cents, and you could be next in punching a free ticket to our $1,000,000 GTD event. https://www.americascardroom.eu/poker-tournaments/online-tournaments/million-dollar-sundays/! I'd rather the $540.00 cash than a ticket. keithcakes, cbtb1987 & Nina Parker just hit a new http://www.americascardroom.eu/online-poker-promotions/million-or-bust/and won their $540 http://www.americascardroom.eu/poker-tournaments/online-tournaments/million-dollar-sundays/ entry! Got a penny? Spin to Get IN. Instead of entering a qualifier, you can try your luck with our Spin to Get IN feature. A penny could lead to the http://www.americascardroom.eu/poker-tournaments/online-tournaments/million-dollar-sundays/tournament right off the bat. This is the next step to making Million Dollar Sundays a weekly event to look forward to. Get into the action and qualify for your seat today!